This post has been sponsored by 7UP® All thoughts and opinions are my own. Two totally delicious recipes that will have your taste buds jammin’. 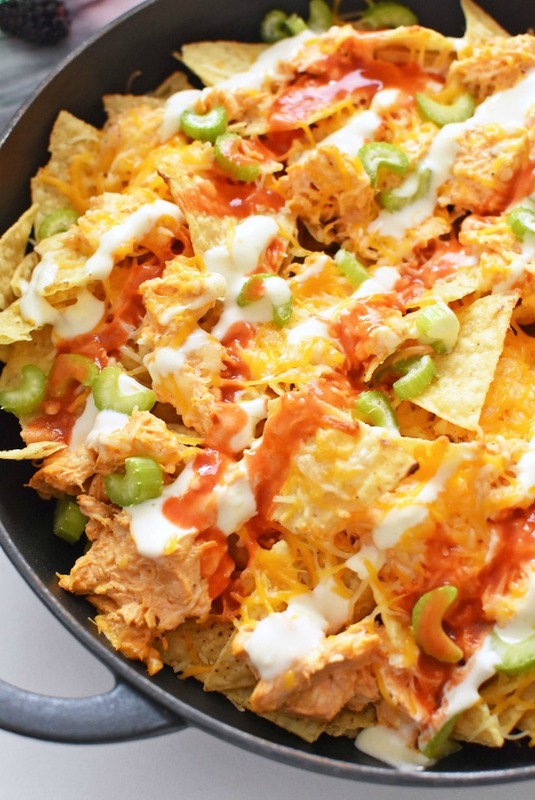 These buffalo chicken nachos are jam-packed with the perfect balance of heat and cheese. 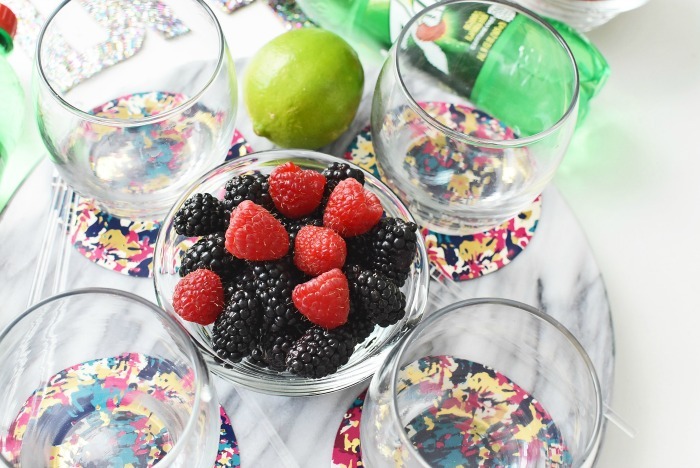 Pair it with a refreshing berry mocktail for a family-friendly occasion. 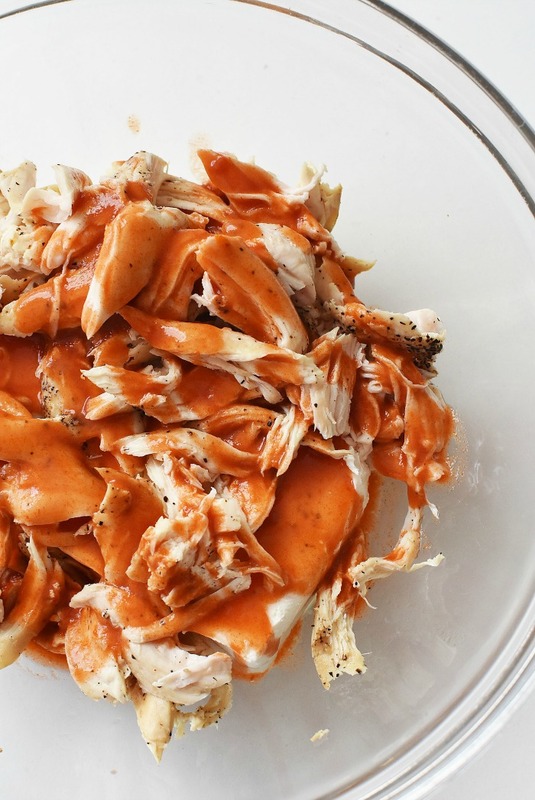 Buffalo Chicken Nachos…oh how those three words make my foodie heart flutter. I do not know who invented this combination but hats off to them. Seriously, buffalo chicken dip + nachos are two of my favorite foods ever. Jared and I are constantly ordering either the dip, nachos, or wings when we have our date nights so it totally works. I have never actually enjoyed Buffalo Chicken Nachos at home, but I knew it was something I wanted to whip up after a friend made them for game days. My family loves spice which is kind of neat so snacks that kick things up a notch are well-received. My family loves spice which is kind of neat so snacks that kick things up a notch are well-received. But, one thing we do find ourselves seeking after a healthy dose of spicy flavor is a cold drink. 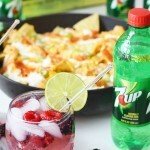 What better way to enjoy some Buffalo Chicken Nachos than with a nice cold Berry Delicious Mocktail featuring 7UP? We bought our 7UP from Dollar General. I love this store because it is local, and smaller but mighty. They have so much fun stuff for all seasons and the prices are always right! 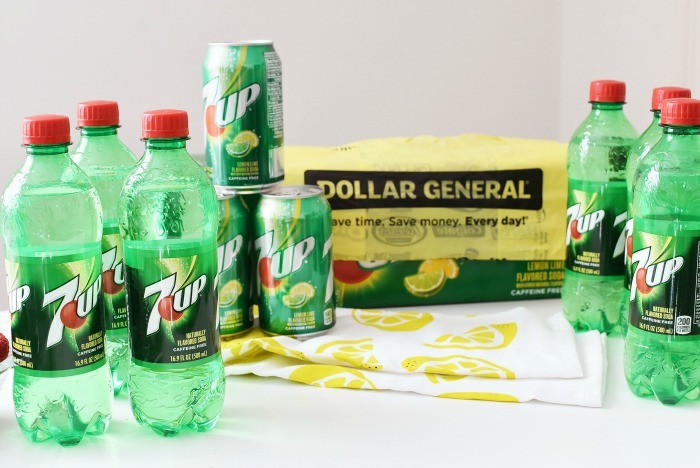 Speaking of, did you know you can find 7UP 6-pack bottles on sale for 3/$10 every day? That is my kind of deal right there. With a family of five, we tend to shop where the prices are affordable, and Dollar General fits that bill! I love that I actually live close by now after our move! I picked up a 12-pack of 7UP and a 6 -pack of bottles for the week. 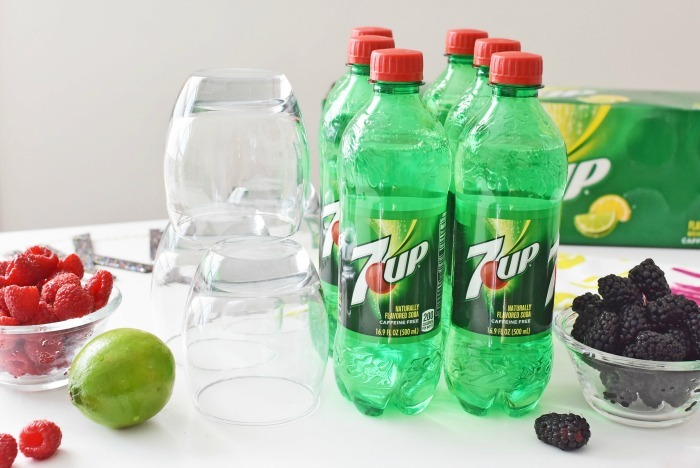 I tend to buy 7UP a lot because we prefer the crisp, fresh, and carbonated flavor. Our family celebrates our self-proclaimed “Foodie Friday” twice a month -where we all enjoy some extra fun foods.Basically, we enjoy foods that are normally appetizers as a family. That is where these Buffalo Chicken Nachos & Berry Delicious Mocktails come into play. 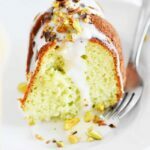 They are quick to make (I prep my ingredients ahead of time) and they are yumtastic! Besides our Foodie Fridays, I can think up just about any occasion to celebrate good foods! 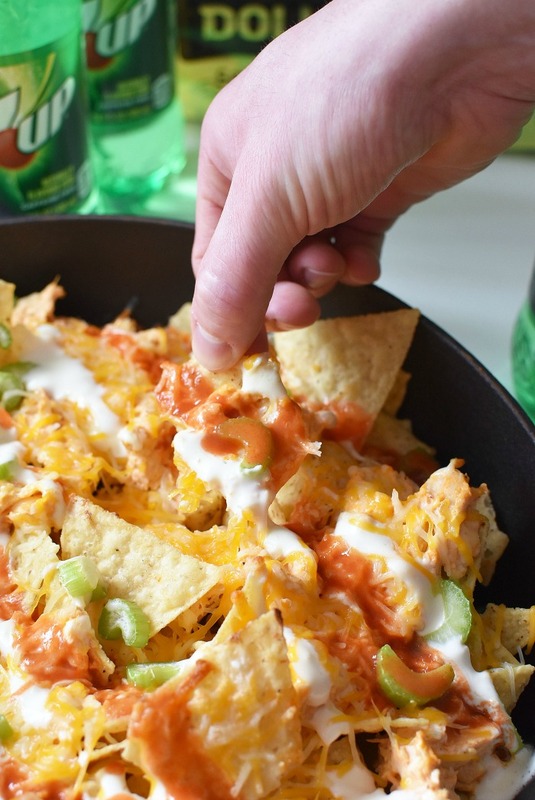 These Buffalo Chicken Nachos are so cheesy and yummy. I combine the shredded chicken, cream cheese, and pepper sauce to make a cream cheese chicken base. Then I carefully tuck some in between each layer of chips to make sure they are all even.Then comes the blue cheese drizzle, the celery pieces, and the shredded cheese. I use my cast iron pan to get a toasty, evenly baked chip. Then comes the blue cheese drizzle, the celery pieces, and the shredded cheese. Once they come out of the oven they are ready to enjoy! 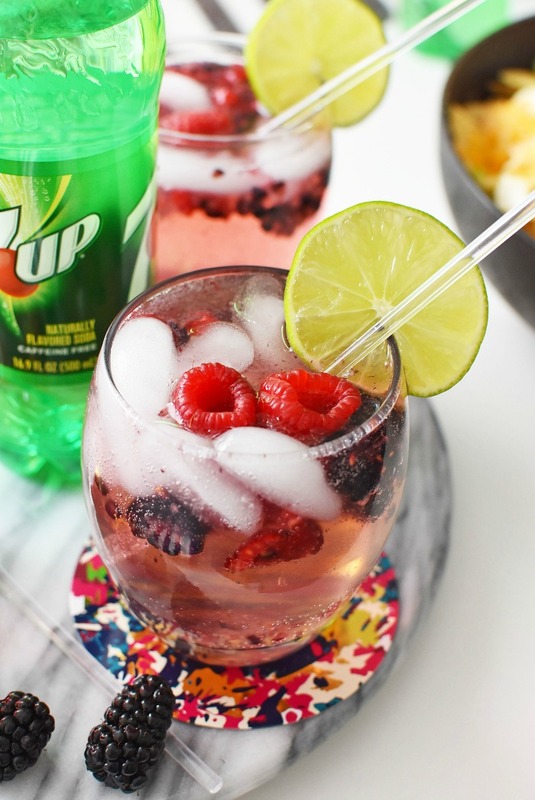 But, while they are baking, be sure to line the glasses for our Berry Delicious Mocktail.This mocktail is refreshing and features 7UP paired with fresh lime, raspberries, and blackberries–oh, and ice to keep things chilled! 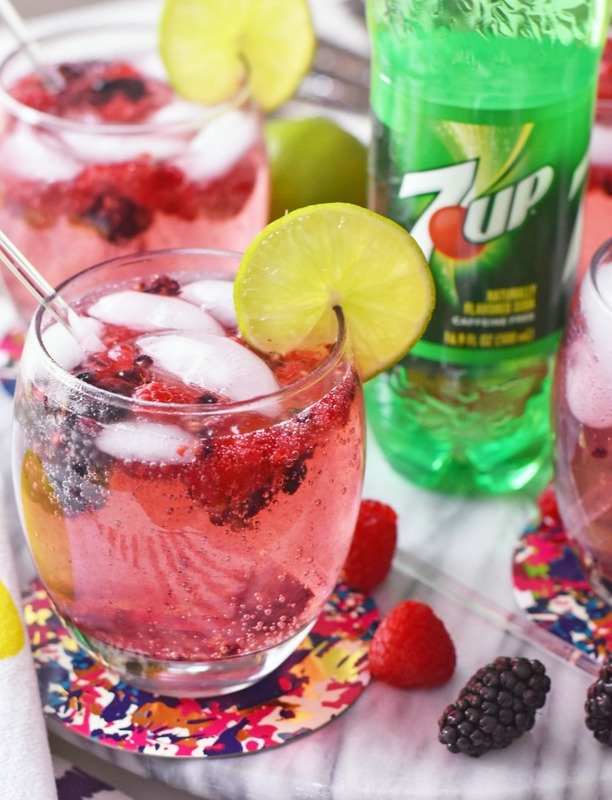 To make them, simply add some crushed blackberries and raspberries to the bottom of your drink and pour over the 7UP. Then, squeeze in some fresh lime and garnish with extra fruit. It is scrumptious and refreshing–perfect to enjoy a Foodie Friday! If you would like to recreate this deliciousness, be sure to pick up some 7UP from your local Dollar General. While you are there, check out all the foods, household, and seasonal products they have to offer at extremely affordable prices. 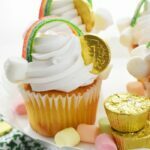 Check out these delicious 7UP Cupcakes from Dollar General! Get everything you need to make them in-store! Two totally delicious recipes that will have your taste buds jammin'. 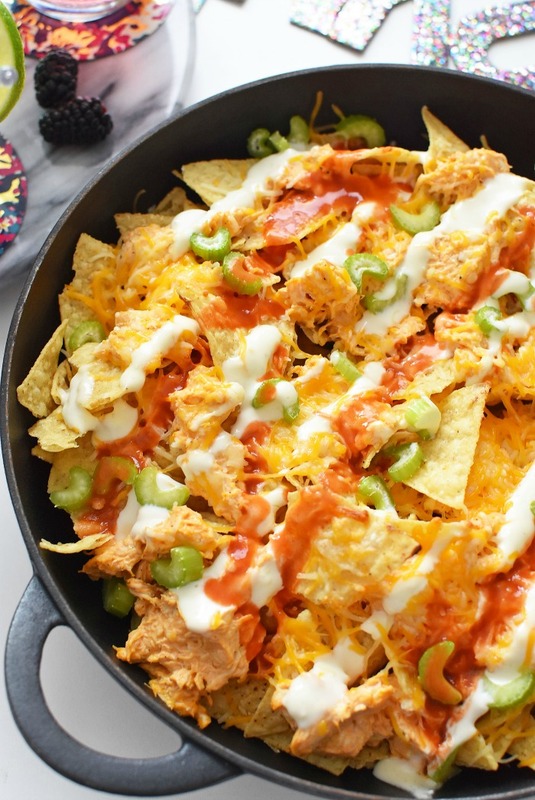 These buffalo chicken nachos are jam-packed with the perfect balance of heat and cheese. 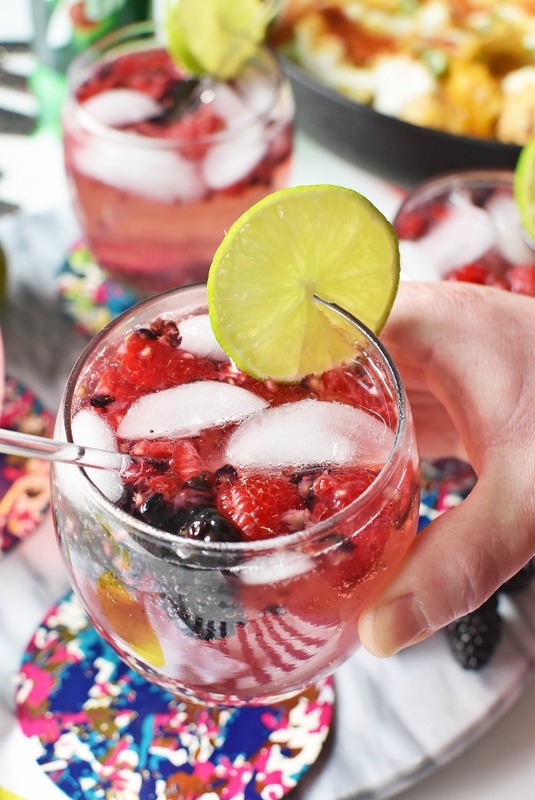 This mocktail is family-friendly and not only super pretty, but mega tasty! Chris and I snack on nachos at least once a week. I am totally making these this week when we have them. Yum! 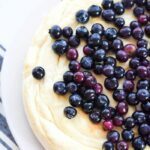 We don’t eat nachos too often but my son loves chips so I will have to make this for him and the great berry mocktail. This is the perfect combo for a family friendly party! I’m not a big fan of alcohol around the kids, so a delicious plate of nachos with a tasty, family-friendly drink is my kind of atmosphere. 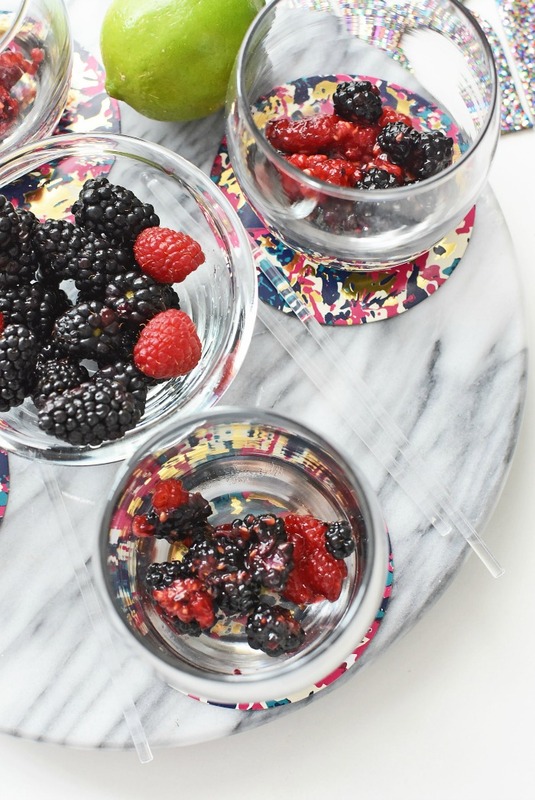 Where did you get such great looking berries this time of year? 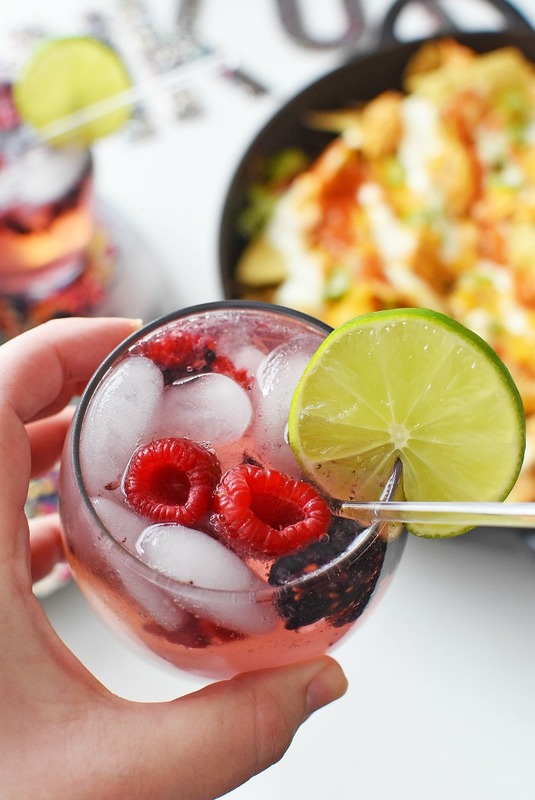 I love that mocktail and I will keep these nachos in mind for a big game. This would be great for the entire family. We can all enjoy a mock tail and have some nachos while we sit in front of the TV I have a movie night. This looks delicious. Those nachos and drinks really made me excited for spring! The mocktails look so refreshing! This looks like a fabulous pairing, how have I never enjoyed buffalo nachos before? 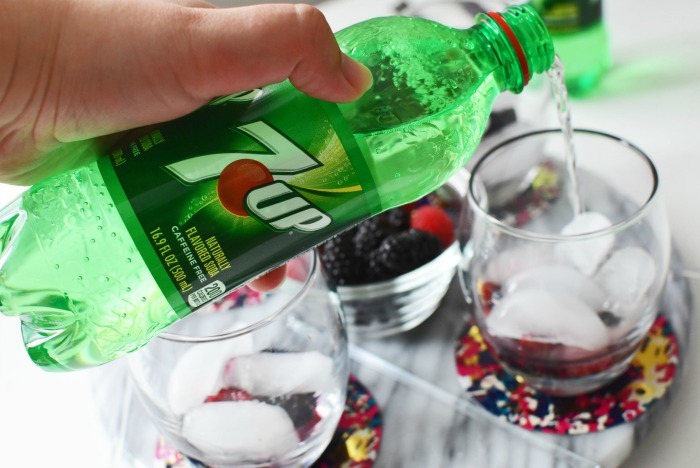 We like to freeze fruit in ice cubes and add it to our 7UP for a nice treat. 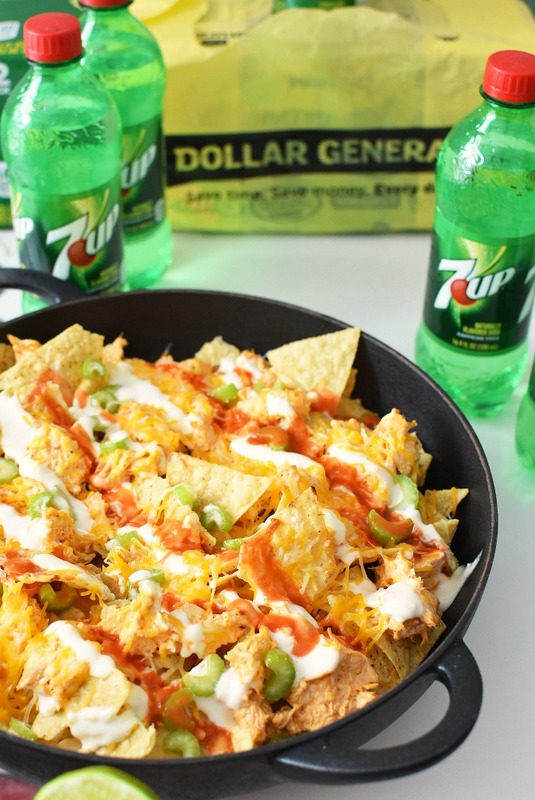 My guys would DEVOUR these Buffalo Chicken Nachos! What a great idea to use these flavors instead of the traditional Mexican flavors on nachos. I like new twists on favorite dishes. We are nacho obsessed! I love changing up the normal nacho and doing something fun like your recipe. And the Mocktail looks so refreshing. The nachos look so delicious. The mock-tail looks fun for the kids. My boys would love both. these look delish! i need to try them all soon. perfect for everyone in the family. 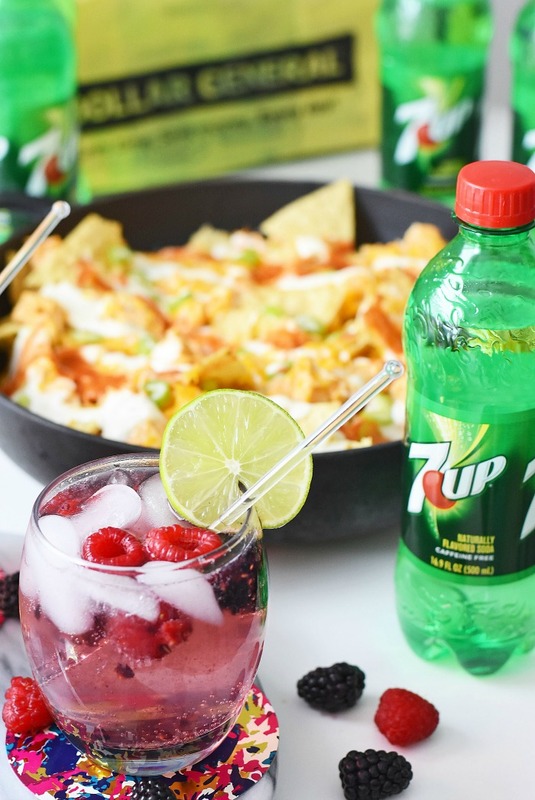 The Buffalo Chicken Nachos and the Berry Delicious Mocktail would be a perfect weekend snack for the family. I think this would also be great to serve when my son’s friends stay over for study group nights. 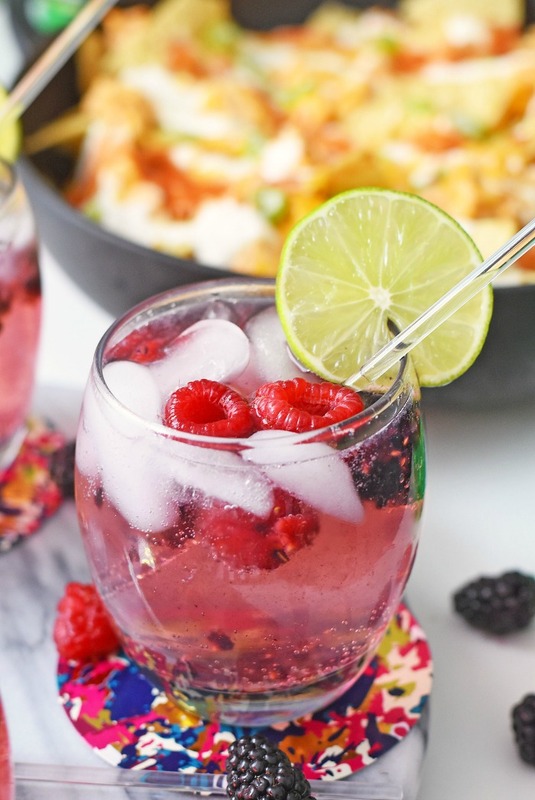 That berry mocktail looks absolutely delicious! It must be so sweet with the fruit and 7Up. It must be so refreshing to have on hot days. Those berries look great. My oldest loves nachos and he also loves hot things so I’m guessing he’d ne up for trying these. My boys will praise me if I make this nachos for them, no doubt about it! 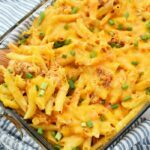 It’s definitely the ultimate recipe and I can’t wait to make it on our next movie night! This is the perfect combo for a teen friendly party! I’m planning one right now for my son’s team! I’m not a big fan of alcohol around the kids, so nachos with a yummy kid friendly drink sounds great! This looks delicious! 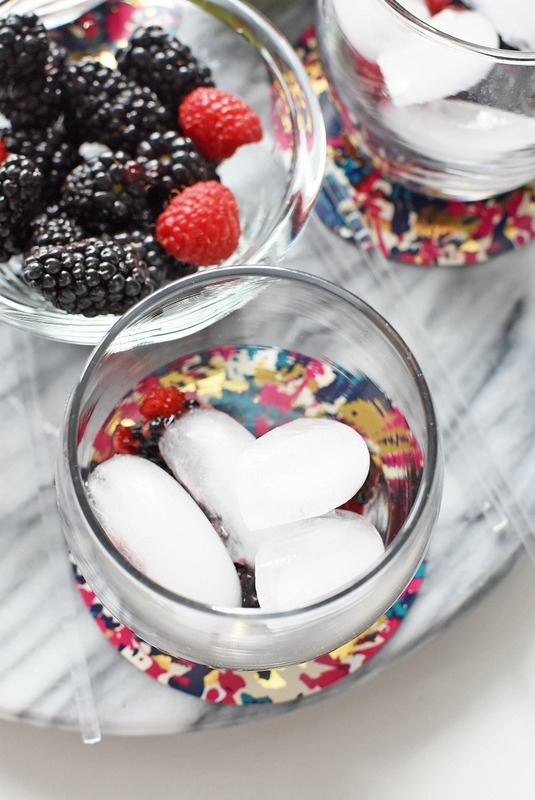 I love any drink with berries so this would be perfect. I’m sure the whole family could enjoy or would be fun to make for a dinner party! 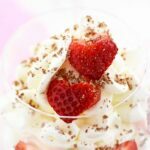 Mocktails are perfect for parties with kids! Or if the adults are trying to avoid alcohol! This one looks so refreshing! Also, I love that you shared your nachos recipe, it looks SO good, you got me craving by just looking at the pictures.